It’s official! On Monday, April 22, Governor Doug Ducey signed a bill prohibiting all motorists from “physically holding” or “supporting with any part of the body” any wireless communication device in the Grand Canyon State. The law, which goes into effect immediately, outlaws any phone related activity unless it’s hands-free. That includes typing, sending or reading text messages; talking on the phone; taking a selfie; browsing social media; surfing the internet; and typing, sending or reading an email. Tempe – Tempe mirrors state law; drivers can’t talk, text or hold their phone, unless hands-free or stopped at a red light. Fines are $100 for a first offense, $250 for a second offense, and $500 for subsequent violations within a 24-month period. Fountain Hills – Texting and driving is illegal in Fountain Hills. Motorists caught violating local ordinance are subject to a fine of $100 for a first offense, $250 for a second offense, and $500 for any subsequent violations within a 24-month period. Phoenix – Texting while driving within Phoenix city limits is illegal. Glendale – The Glendale ordinance prohibits talking, texting or otherwise using a cellphone while driving. The minimum fine for a first offense is $250. Surprise – Talking, texting or anything involving a handheld communication device are prohibited in Surprise. The minimum fine for a first offense is $250. Using a cell phone while driving creates enormous potential for deaths and injuries. That is according to the National Highway Traffic Safety Administration (NHTSA). It kills about nine people each day and injures thousands more. Standing behind Gov. Ducey, as he signed HB 2318 into law on Monday, were just some of the families of these victims. Each sent text, phone call or other phone related activity, combines all three types of distraction. That means that you’re endangering not only your life but the lives of your passengers and other people on the road. The latter includes pedestrians as well. It’s simply not worth it and now it’s against the law in the state of Arizona! What are the penalties for the hands-free law? Beginning January 1, 2021, you can be fined between $75 and $150 for a first offense. Second and subsequent violations carry a fine up to $250. Meanwhile, existing local laws remain in effect and can be enforced, even if a city or county ordinance is stricter than what’s in the new law (see above). Can a police officer pull you over before January 1, 2012? Yes! 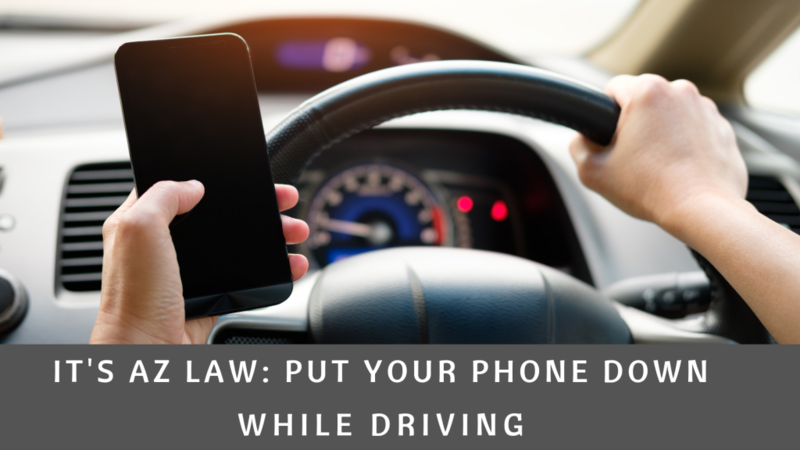 Because HB 2318 takes effective immediately, you can be pulled over for using or holding your phone while driving, although police officers can only issue warnings right now. The grace period before citations will be issued allows law enforcement to educate the public. Are there any exemptions to the new law? Drivers can make and receive calls using Bluetooth devices (e.g., headphones or earbuds, digital media receivers, or wrist-worn smartwatches etc.). You must be able to voice activate and deactivate all functions. Drivers can send or read texts, as well, but only if their devices allow voice-to-text. Is it legal to text at a red light? Arizona motorists can still read or send text messages while stopped at a red light, although that does not necessarily mean they should. “Texting while at the light” is not without risk, according to a 2015 study conducted by the National Institutes of Health (NIH). 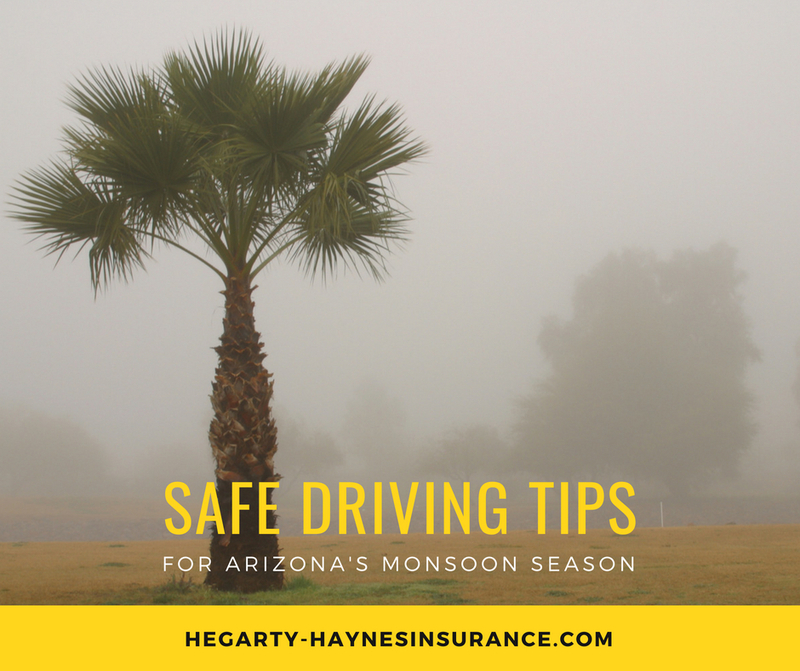 As an independent insurance agent, Hegarty-Haynes Insurance, Inc. is committed to educating Arizona drivers and providing solid insurance quotes at competitive rates. 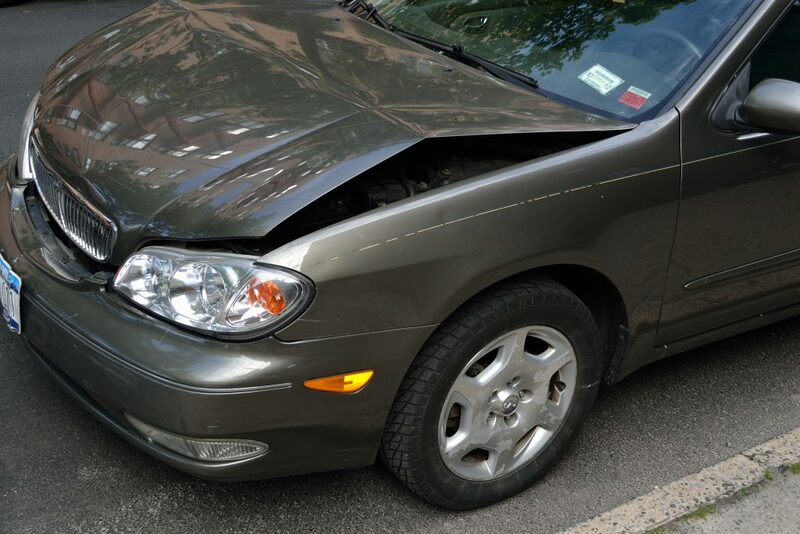 Contact us today at (480) 820-2297 for a free auto insurance quote. There is more to spring than mild temperatures and blooming flowers. 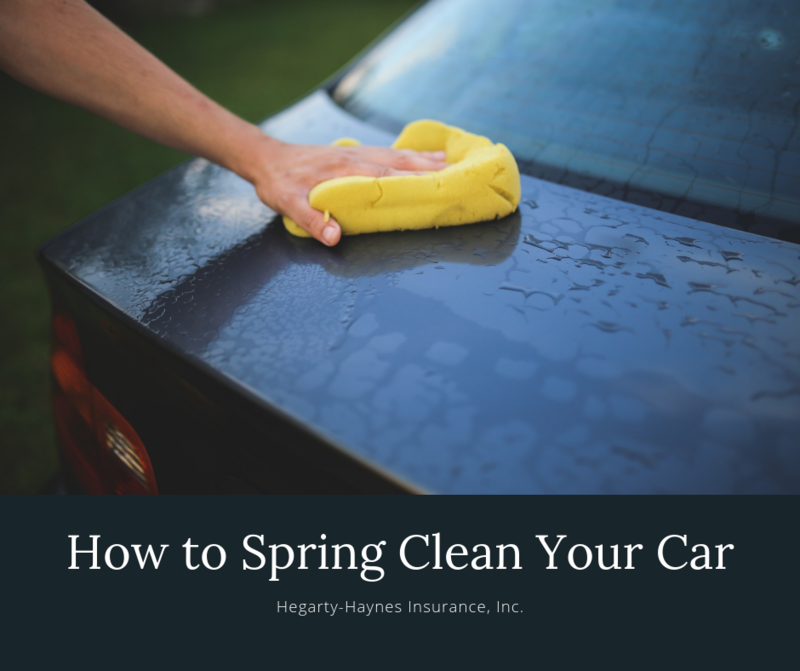 It’s also the season for refreshing your home and landscape, hence the term, “spring cleaning.” Your vehicle can also benefit from a deep cleansing. Use these tips to spring clean your car before the weather heats up. Every vehicle owner knows that cars can get messy, especially when no organization system is present. First, declutter, using separate bags for trash and any items you still want to keep in your car. Once you’ve decluttered the car, purchase a trash can, trunk organizer, and other organizational products to help control clutter. 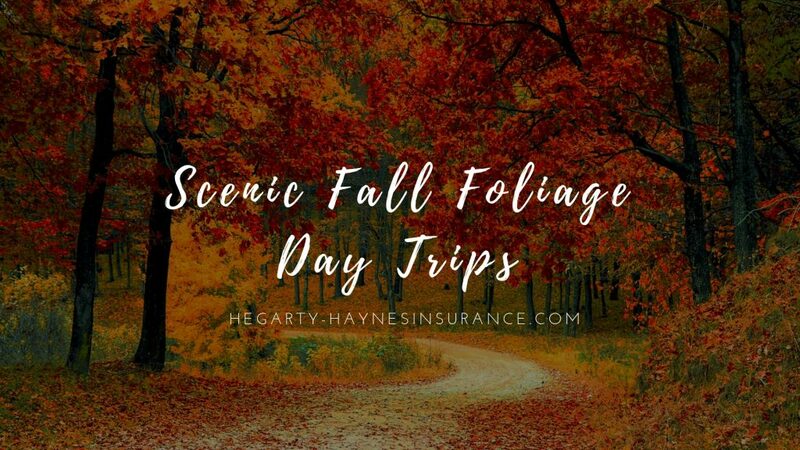 Purchase a coupon folder for essentials (e.g., registration, insurance card, roadside assistance card, emergency numbers (in case your phone battery dies)) and store in your glove box. After decluttering, spruce up your interior, starting by thoroughly vacuuming the carpets and upholstery. Use different attachments to get into tight spaces and for delicate surfaces. While you have the vacuum out, use a hard-bristled brush to clean your vents, vacuuming the dust up while you work. Next, wipe down your entire dashboard, console and around the steering wheel. Apply a protectant to these surfaces as well as any leather upholstery. This will help prevent sun damage. Using warm water and a car wash solution (using dish soap is not recommended), thoroughly wash your car, working from top to bottom. Use the two-bucket method – one bucket for warm soapy water and the other for clean water – along with two separate sponges or microfiber cloths. Waxing your car after washing can add shine and help protect the paint. Consumer Reports recommends using liquid wax products. For best results, always follow manufacturer’s instructions. Spring is also a great time to use a portable carpet cleaner to deep clean your vehicle’s carpets and upholstery. Fill a bucket with hot water, dishwashing detergent, and a cup of white vinegar. Use a hard bristle brush to agitate the fibers. Let sit for about 30 minutes before rinsing with water and blotting dry. You may need to crack the windows overnight to ensure it complete dries. Clean leather with a cloth soaked in water and a low-pH soap. Allow to thoroughly dry. Condition for added protection. Damaged or worn wiper blades can reduce driving visibility during spring showers. Check your wiper blades for any signs of wear and tear or improper contact with your windshield semi-annually. Reference your owner’s manual for correct blade length. You can find replacement blades for under $20/each at most any auto parts store, big box retailer, and warehouse store. There are drivers who think it’s alright to drive down a highway with a phone in their hands. They scroll social media, type out mile long texts, and even play games. 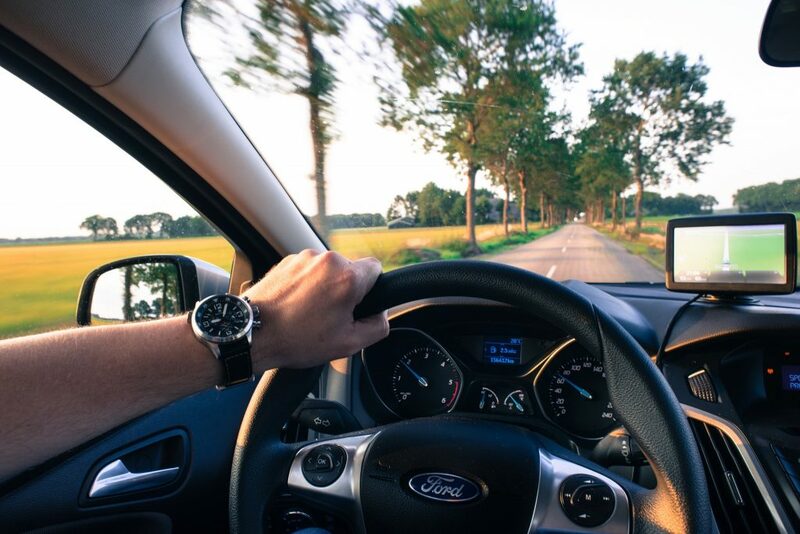 Other drivers try to maneuver away from the distracted driver, hoping to put themselves a safe distance away, which is no easy feat in rush hour traffic. Distracted driving is a nationwide problem that, in 2016, claimed the lives of 3,450 people. After an increase in accidents involving distracted drivers, many cities throughout the Valley are enforcing hands-free cellphone use; anyone caught holding a phone is subject to a steep fine. Arizona is currently considering a statewide ban as well. Drivers should assume that all cities have hands-free ordinances and use a wireless charging mount coupled with Android Auto or Apple Car Play. Hands-on activities can wait! The Insurance Information Institute recommends checking your insurance policies (i.e., home, auto, life) annually to make sure everything is up to date. You may also want to compare your rates with other companies; you may even find a better rate. 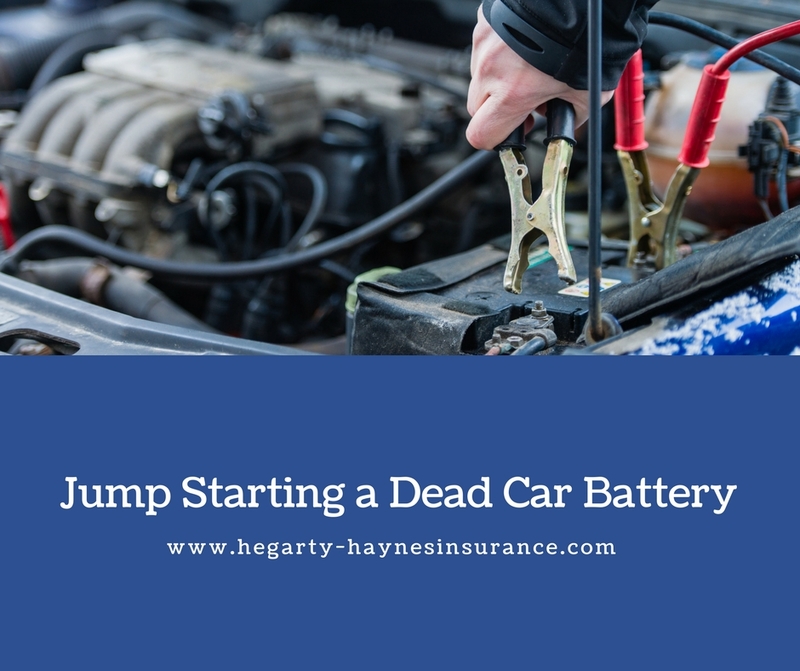 If you’ve recently purchased a new car, you risk being underinsured or over insured, depending on the age, make and model of your new vehicle unless you report the change to your independent insurance agent. Right now, there are just seven days until the biggest Holiday of the year, which means people are putting the finishing touches on their holiday decorating and purchasing last-minute gifts for family and friends. Many others may be finalizing their travel plans or preparing a feast for 12. 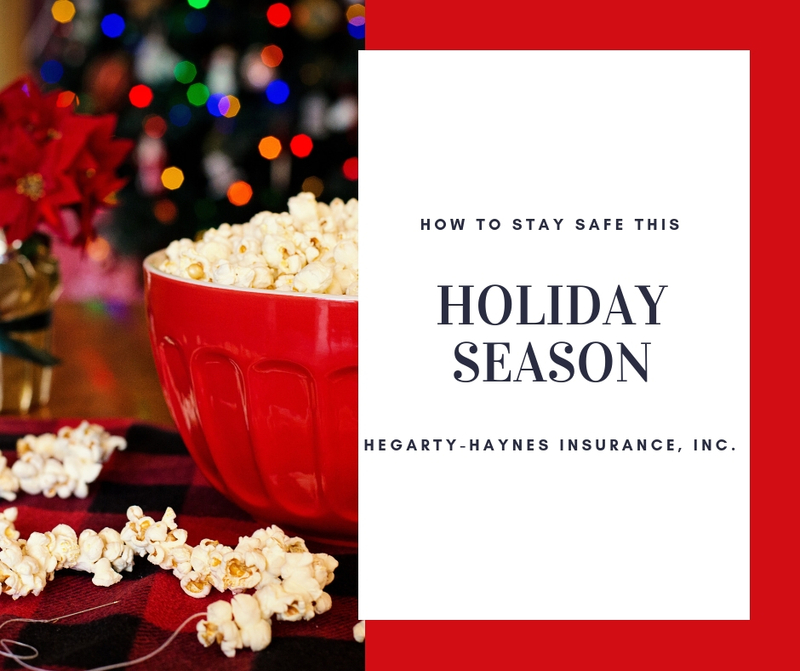 If you fall into one or more of these categories, it is important to take several precautionary measures, thus ensuring you and your loved ones can enjoy the holiday season in the safest way possible. Stay safe this holiday season using the following four tips. Between 2012-2016, U.S. Fire Departments responded to approximately 970 home structure fires that began with holiday decorations, including the holiday tree. Always make sure to choose LED (they generate less heat) light sets that are “UL Listed;” inspect strands for frayed wires, loose connections, or other damage; and only connect a maximum of three sets. Place holiday trees, whether real or artificial, away from all heat sources. If real, water frequently, and properly dispose of it as soon as it dries out. The U.S. Consumer Product Safety Commission provides a publication with additional safety tips to help you stay safe this holiday season. Each year, U.S. Fire Departments respond to hundreds of kitchen fires caused by unattended cooking, according to the National Fire Protection Association (NFPA). The leading dates for these fires are Thanksgiving, Christmas Eve, and Christmas Day. That’s why it is so important to remain in the kitchen while cooking; keep flammable items, like oven mitts, wooden utensils and kitchen towels away from the cooking area; make sure kids stay three-feet away from appliances and hot food/liquids; and turn handles away from the edge to prevent pots and pans from being knocked over. Additionally, you should unplug all small appliances, including pressure and slow cookers after each use. According to a 2017 survey conducted by Xfinity Home, Comcast’s home security service, 30 percent of Americans report experiencing package theft. Unfortunately, most of these follow the biggest shopping days of the year; Black Friday and Cyber Monday. Thanks to modern technology, you have several options for protecting your packages from holiday Grinch’s, regardless of which delivery service the sender may choose to use. First, there are security cameras, which stream and record live footage of the area surrounding your front door. These devices have motion sensors that are designed to alert you as soon as even the slightest movement is detected. Most also feature infrared technology for night vision. You can find a wide range of outdoor security cameras online and at local electronic stores. Another option is to send your packages to a nearby Amazon locker. You are instantly notified once the package has arrived. The notification includes a unique six-digit code that you can use to pick-up your package within the provided 72 hours. This code can also be found by going to “Your Orders” then “Track Package.” If you have multiple orders, one code unlocks all lockers used, one at a time. Follow on-screen prompts. If you’re traveling during the holidays, arrange to have your city’s Police Department keep an eye on things; several precincts offer vacation watch programs. The cities of Chandler, Gilbert, Peoria, Scottsdale, and Queen Creek can all patrol your home more frequently. You must notify them of your plans at least one week prior to your absence. Each city requires you to complete a “Request Vacation Watch” form. This form, which can be filled out online, asks for your contact information (e.g., name, address, email, and phone number) as well as your travel schedule. Pertinent information, like whether your house lights are on or on timers, the make/model of any vehicles parked in the driveway, if anyone is watching your home, etc. is also requested. This ensures officers/volunteers know what to expect when watching your home. 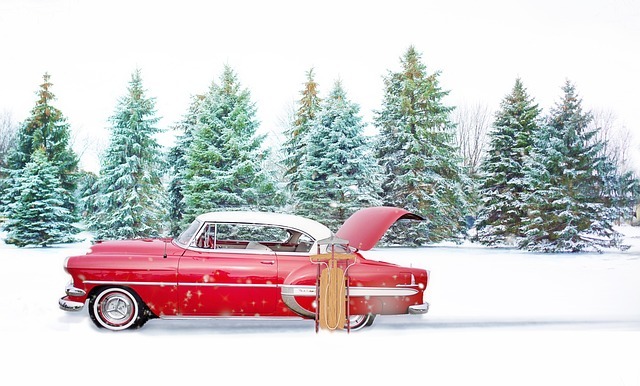 Hegarty-Haynes Insurance, Inc. would like to wish you Happy Holidays and a joyous New Year. Also, remember to stay safe this holiday season! As an independent insurance agent, we are committed to providing our clients with superior service and solid insurance solutions, all at competitive rates. Contact us at (480) 820-2297 for a free insurance quote.